Asparagus is sautéed until tender and flavored with young green onions. 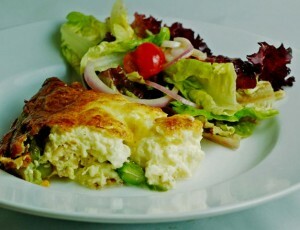 This ricotta quiche is great for groups and healthier without the crust. Enjoy with a fresh spring salad. Preheat the oven to 375 degrees F. Prepare an 8-inch square baking dish with a light coating of oil or cooking spray. Prepare a skillet with another light coating of oil or cooking spray. Place the prepared skillet over medium-high heat. Sauté the asparagus, stirring once or twice, for 5-7 minutes, or until the asparagus has just started to brown. Add the green onions and garlic to the skillet and cook 2-3 minutes more, or until asparagus is partially browned. Remove from heat and season with salt and pepper to taste. Whisk together the eggs and milk in a mixing bowl. Fold in the ricotta and stir to combine. Fold in the sautéed veggies and pour into the prepared baking dish. Cook for 25-30 minutes, or until the eggs are set and puffy. Let cool slightly before serving.